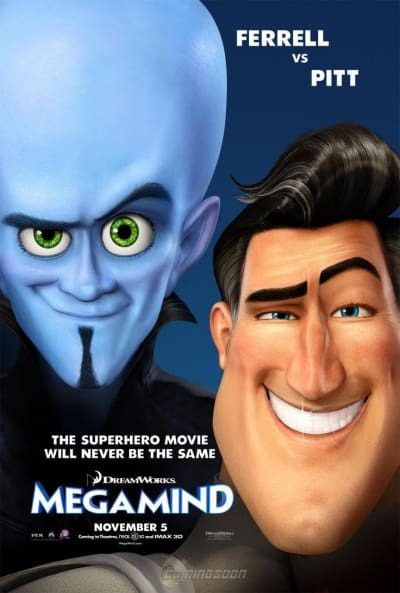 Megamind hit it off big time with audiences this weekend, bringing in a whopping $47.7 million to land at #1, beating out Robert Downey Jr. and Zach Galifianakis in Todd Philips' Due Date. Megamind's opening even beat out Dreamworks' previous heavy hitter How to Train Your Dragon's $43.7 million opening back in March. Due Date came in second with $33.5 million, slightly above studio expectations, but it wasn't the record-setter Philips' previous effort, The Hangover was. Tyler Perry's For Colored Girls came in third with $20.1 million, a bit lower than the filmmakers' previous Why Did I Get Married Too?, possibly signaling an audience preference for his cross-dressing antics. Red held in there another week at 4th, dropping only 17% to earn another $8.8 million to bring its total to $71.8 million. Not bad for a bunch of old farts. Unfortunately, the returns weren't so kind for Jigsaw, as Saw 3D dropped a whopping 66% from its first weekend to earn only $8.2 million for a total of $38.8 million. Ethan Tremblay: Oh God! I'm so stupid. Ethan Tremblay: Where's your dad? Peter Highman: Uh... no idea. Ethan Tremblay: When's the last time you saw him? Peter Highman: 1977. He had his bags packed at the door and he picked them up and put in the back of his car. And, uh, drove away. Last time I ever saw him. Ethan Tremblay: That's so funny! My dad would never do that, he'd love me.